At Bowman Road Animal Clinic we hear stories about our feline patients being selective about entertainment. Cats have a habit of being provided pricy, animated toys, only to ignore them. Then their owners watch them become overly enthusiastic about a grocery receipt. What makes cats play with what they play with? What is the first thing that comes to mind when you think of kitty entertainment? Most cat owners think of laser pointers and feathers. Cats are also known for their attraction of catnip. Catnip is a great way to get your cat interested in a toy. However, many cats — as many as 50% — do not respond to catnip. Laser pointers almost always catch your cat’s attention, even large cats. Here are a few tips for playing catch-the-laser-pointer with your cat. Get a laser pointer that is specifically meant for cats. You can find these at pet stores and even grocery stores that have a pet toy section. Treat your cat when they “catch” the red dot. Your cat may become uninterested in a phantom target. When they finally pounce, be ready to reward their skills with a treat. Feathers are also a great go-to toy for your cat. Fluffy objects activate predatory urges in your cat. (Remember when fluffy pens were popular?) Feathers that look like the feathers found on birds are the best kind of fluffy entertainment for your cat. When is it time for new toys? Your cat will get tired of their toys after a while. You’ll need to keep an eye on their interest in their toys. Be ready to provide new ones when the current selection has been eyed over. Cats like fluffy balls to bat around and chase. They might even take it on themselves to find toys to play with. Hopefully, they find something safe and non-messy to play with, like a ball of foil. Create entertainment that meets your cat’s entertainment needs. Your cat is happiest when they get the right amount of attention from their owners and enough activity with stimulation and movement. Choose toys that require your cat to do some problem-solving. Put treats inside a puzzle toy to keep your cat busy. Have at least a few toys that your cat only plays with when you are around. This could be a fluffy feather on a string that your cat chases while you animate it. Toys will also keep them entertained, and hopefully out of trouble. Don’t forget the necessary toys like scratching posts and chewing dental toys. 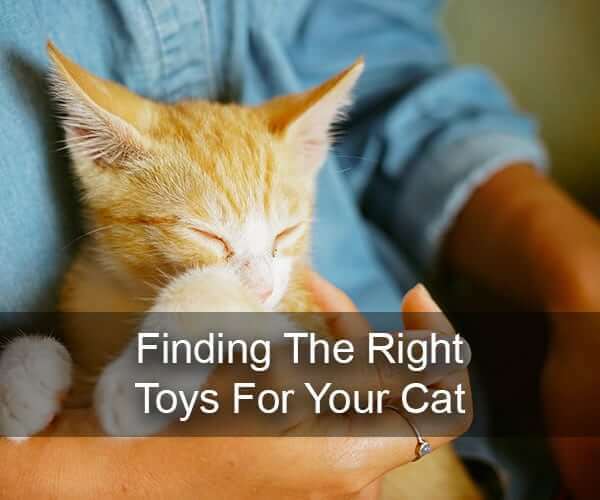 Having trouble finding the right toy for your cat? Think outside the box. Just make sure the toys are safe for your cat.